Everyone has heard the old saying "you reap what you sow" or "you get out what you put in." When it comes to managing for 'Trophy Class' whitetail bucks it couldn't be more true. For years most wildlife specialists were under the general impression that if a whitetail deer had the 3 necessities they would produce big antlers. Lets begin with the 3 necessities I'm referring to and then we'll discuss the 'X' factor in growing/managing for big antler characteristics. Number 1 is whitetail deer must have access to a decent amount of food source. Since whitetails are similar to cows in the sense that they have 4 stomach chambers or compartments which make them ruminants they need to continuously graze/browse and chew their food/cud much like a cow does. The main difference is grasses only make up about 10% of a whitetail's diet but it makes up 90% of a cow's diet. So whitetails need plenty of browse in their diet and since they are herbivores they eat a wide variety of foods including green plants in the Summer; acorns, fruits, and nuts in the Fall; and twigs or woody fibrous plants in the Winter. The 2nd necessity for Whitetail deer is a good water source. In optimal conditions water that is flowing and more fresh is preferred my most animals especially Whitetail deer. And 3rd is a sufficient amount of cover. Whitetail deer need cover for many reasons but primarily for safety reasons. Deer need to feel safe traveling to and from food/water sources but more importantly when females give birth to fawns in the summer. Just like humans we need to have some privacy in our lives and Whitetail deer are no different. Earlier we mentioned the 'X' factor in managing/growing Trophy Whitetail Bucks. The 'X' factor is genetics but to understand the role that genetics play in antler development it is first necessary to understand the contributions other factors make to a buck's antlers. Most importantly, the animal has to have adequate nutrition. Without adequate nutrition a buck with the genetic background to become the world record white-tailed buck might be less than average. Age is also important in determining the potential of a Whitetail bucks antler development. In other words you can't assume that a buck that is 1.5 years old carrying two little 'spike' horns that year will not grow into a 180" monster in 3-4 years. A 1.5 year old buck is only displaying 10% of his antler potential at that time. Young deer are growing just like a newborn human, therefore, all of the nutrition it receives is utilized by its structural body and whatever is excess is shown in antlers. Is it starting to make more sense now? Also, the Whitetail doe carries 60% or better of the genetic antler potential of its offspring. Are you beginning to realize the complexity of managing/growing 'Trophy Whitetail Bucks'? Its not about finding a 250" monster and putting him with any old Whitetail doe. It actually makes more genetic sense to find out who was the mother of that 250" monster. Managing for Trophy Whitetail Bucks is an expensive yet rewarding journey. 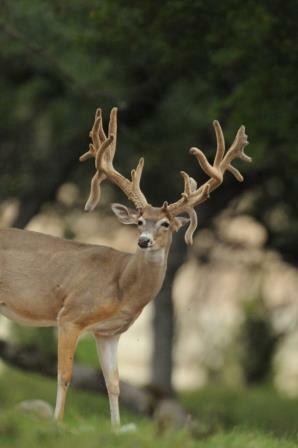 Many game ranches in Texas have been genetically selecting antler characteristics and growing enormous bucks for several decades now. Some would argue that they have it down to a science. Genetic selection has been taking place since the beginning of man, albeit on a different scale for different reasons. Whitetail deer hunting in Texas is a multi-billion dollar business. A sizable portion of that industry demands large Whitetail bucks for you and I to hunt. If the demand to hunt these 'legends' of the woods, if you will, continues to increase yearly then we have to continue managing for Trophy Whitetail Bucks. The industry must continue to focus on quality nutrition, good water sources, and adequate cover for this species to prosper. Proper and ethical selection of antler genetics must accompany this industry into the 21st century if it is to survive. So the next time you're out in the wild scouting and hunting for your 200" monster Whitetail buck, remember, the majority of those antlers came from his momma.